Is Eating Fruit Really That Bad? Today’s post is my answer to a readers two questions to me…I did attempt to answer this via a vlog, but it became a bit too technical and long and I couldn’t remember everything I wanted to tell you, so after about 10 takes (and a lot of swearing!) I gave up and wrote it instead! Today, I have a question: what are your views on eating fruit. Not a lot, but just say, an apple or two? For breakfast on most days, (and sometimes a banana as a snack later on). I have these ‘digestive’ issues you speak of, as well as many sensitivities to chemicals (inhalant allergies is what my specialist calls it; another calls it toxic overload). Anyway I follow a diet based on the paleo template but there are many foods I can’t have. I’m best with fruits, veggies and proteins. Sugar in it’s refined form is one food that sits awful with me, but I seem to digest fruit really well, so long as it’s not on top of proteins. I know fruit contains fructose, and with my following a paleo diet, which stipulates not a lot of fruit, I was just wondering if you could offer your views on eating fruit and the paleo diet, and whether you think it’s a healthy thing to be doing long term. Thanks for your questions Miche! 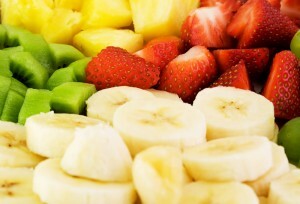 Let’s start with your concern with eating fruit. Assuming you have no blood sugar issues or intolerances to FODMAPS, eating 1-2 pieces of fruit at the very most per day, is fine. I say this as I already know the bulk of your calories are coming from whole foods in the form protein, veggies and hopefully some good fats! It would be a different story if you were also eating processed foods containing sugar (table sugar – sucrose – is half glucose, half fructose. Glucose is used for energy, fructose is converted to fat). If you were eating sugary foods, drinking sodas or fruit juice AND having a couple of pieces of fruit a day, you’d definitely be in trouble. In fact forget about the fruit, consuming processed foods, sodas and fruit juice alone is going to make you stack on the weight BIG time! But I’m guessing ya’ll know that already! Let me start with explaining what fructose is. Fructose is a simple sugar found primarily in fruit and usually found together with some glucose and sucrose. It is also found in table sugar, high fructose corn syrup, and to a much lesser degree, some vegetables. …gets rapidly and totally converted to circulating fatty acids and manages to avoid all of our control mechanisms in the process. When we eat carbohydrates, proteins and fat, insulin and CCK tell us when to stop eating, and insulin and PFK-1 control the use of the glucose. There are no equivalent controls for fructose. When the only fructose in our diet was in ripe fruit, this didn’t matter much. We have enough sensors in our pancreas to trigger an insulin response in the quantities found in a few pieces of fruit. It is only when we over-consume fructose that the ‘loop hole’ in our appetite-control mechanism opens up. In a modern diet, where most food is now flavoured with fructose compounds (like sugar and high-fructose corn syrup), this is a recipe for obesity and much worse. So How Much Fruit Can I Have? I-2 pieces a day seems to be about the amount of fructose your body can process. But start including added fructose without fibre and you will head into scary ‘fat conversion’ territory. I definitely don’t think we need to be cutting fruit out of our diets! Humans have been consuming fruit for, erm, a pretty long time! Our ancestors ate fruit…but…in small amounts and without any other added sugars in their diet. My advice? Stick to the fruit that is naturally lower in fructose and high in fibre and antioxidants. Even though still relatively low in fructose, I was surprised to learn that blueberries had more fructose than watermelon, honeydew melon and bananas! I still enjoy a serving of blueberries daily as they’re loaded with antioxidants and fibre. Apples contain a lot of fibre too. One last little tip Miche, I wouldn’t be consuming fruit for breakfast if you’re after long lasting energy…protein and some good fats is my recommendation. Is The Paleo Template Healthy Long Term? For more info on what I think of the Paleo Diet or ‘template’ as I prefer to refer to it as, you can read this popular post I wrote on it by clicking here! I think you will find that David Gillespie has MASSIVELY overstated the fructose to fat pathway (especially in humans), some studies say the conversion is as low as 3% other as high as 50%, none that it is total and instant as Gillespie suggests in Sweet Poison! Here is a good overview http://physrev.physiology.org/content/90/1/23.full.pdf+html and the link at the bottom of the following article shows a ‘Sugar Symposia” held recently at a nutrition convention and although people like to instantly dismiss it because of its sponsor, Dr Robert Lustig was one of the speakers! FYI Sweet Poison and Big Fat Lies are notorious for misquoting and cherry picking research to give the illusion of scientific support for David Gillespie’s theories!